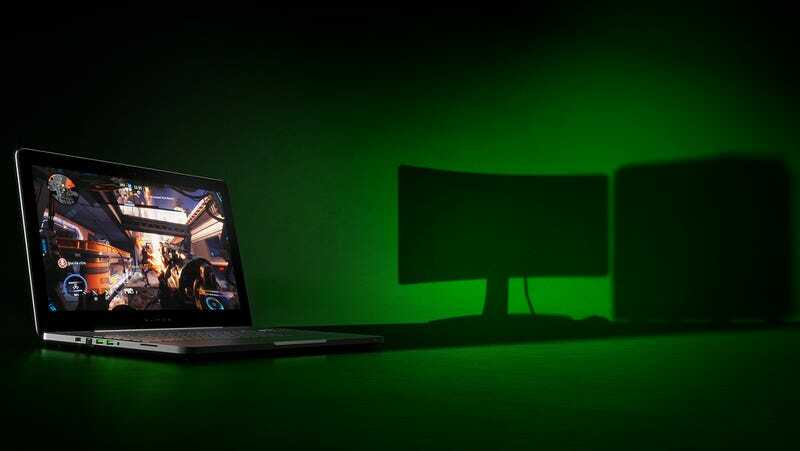 Shadows of the Gaming PC, by Razer’s Marketing Team. Razer’s ultra-thin line of Blade gaming laptops has traditionally been about balancing power with portability. Housing a Geforce GTX 1080 without adding anything to its .88 inch thickness, next month’s new Razer Blade Pro aims to be the best of both worlds. Yes, Nvidia’s made mobile versions of its GTX 10 series GPUs that are just slightly less powerful than their desktop counterparts, but even a mobile chip needs some cooling. Razer’s engineered the world’s thinnest manufactured vapor chamber cooling solution for the new Razer Blade Pro, so while it’s likely its aluminum frame will heat up, it won’t scald or melt. People hate it when their gaming laptops scald or melt. So the new model boasts some real graphical power and has the cooling to back it up. It’s also got a 17.3-inch 4K IGZO monitor (with Gsync), making it a super-skinny 4K laptop that’s actually viable for more than watching 4K video. The new Razer Blade Pro is also the first system to benefit from Razer’s new low-profile mechanical keyboard switches. Yes, this slender thing has a mechanical keyboard. It’s almost like some sort of laser octopus took stuff out of a PC and put it in a laptop. Or maybe that’s the YouTube ad. Yep, that’s the YouTube ad. Now how much would you pay? If you said “a hell of a lot,” then you’re right. The Twitch livestream introducing the new system, embedded below, was all cheers until Razer CEO Min-Liang Tan announced the price. The new 17-inch Razer Blade Pro starts at $3,699 / €4,199, a substantial investment for a system that can’t really be upgraded. Jump to the 47:20 mark in the archive below for the crowd reaction. We’ll have a closer look at the new 17 inch Razer Blade Pro closer to next month’s release. I know I said that about the Blade Stealth and Core combo, but I probably mean it this time.